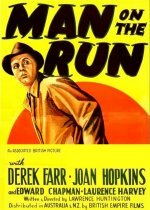 Man on the Run is a wonderful piece of British film noir and this print of German origin is far superioir to any earlier versions going around. An Army deserter, still a fugitive in Post-War Britain, wanders into a pawn-shop robbery and finds himself wanted for murder. He meets a war widow who helps him elude the police while he looks for the real criminals. There is a host of great British supporting actors in this. Look out for Kenneth More, Alfie Bass, Valentine Dyall and the great Arthur Mullard.